Must Sweet Foods Be a Burden to Our Bodies? Dedicated to discovering the unlimited possibilities of delicious food, Home Bake Founder ZHOU, SHU-ZHEN considers enjoying delicious food as a basic human right, which cannot be deprived in any ways– not even illness. While her father is suffering from liver cancer, Zhou personally witnessed her father giving up on many of his favorite foods he used to enjoy in the past. Feeling very sorry for her father, Zhou finally made up her minds to run a bakery that sells sugar-free and healthy food. 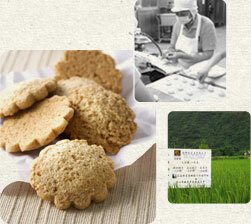 Maltose, similar to sucrose in flavor and texture, is mainly applied to create Home Bake's sugar-free series. With sweetness degree approximately 0.8-0.9 times that of sucrose, maltose only generates half the calorie of sucrose. Hard to be broken down by bacteria that reside in human mouth, maltose is suitable for those who are concerned about personal oral hygiene. Hard to be absorbed by human bodies, maltose is also suitable for diabetic patients who must maintain their glucose at a normal level. Maintaining the same deliciousness despite huge cut in calories, our sugar-free cookies and candies are developed to deliver sweet fragrance and delicate texture rivaling even that of a 5-star western dessert! Aside from sugar-free series, Tsan Yu Yen Food Co., Ltd.'s self-owned brand "Home Bake" is also widely famous for its organic rice. Formerly an instructor to Home Economics Class at Tachia Farmer's Association, Mrs. Zhou was dedicated to teaching several housewives making all kinds of rice cuisines by their own hands. With relatively few experiences in rice cuisine making, Mrs. Zhou has devoted great amount of time and effort in studying the principles behind rice cuisine making. After specifying and digitalizing certain manufacturing processes for rice product making, a comprehensive standard operating procedure is generated and integrated into a single form. After exhibiting some outstanding performances, a small food processing center was officially established within Tachia Farmer's Association, with several housewives started providing catering services to local communities (sometimes even on Saturday and Sunday). In order not to become a burden to Tachia Farmer's Association, Mrs. Zhou decided to leave Tachia Farmer's Association and start her own business. Upholding her original goal of producing organic food, Mrs. Zhou has first established the brand Homebake in 2000 to provide general public with organic rice products. 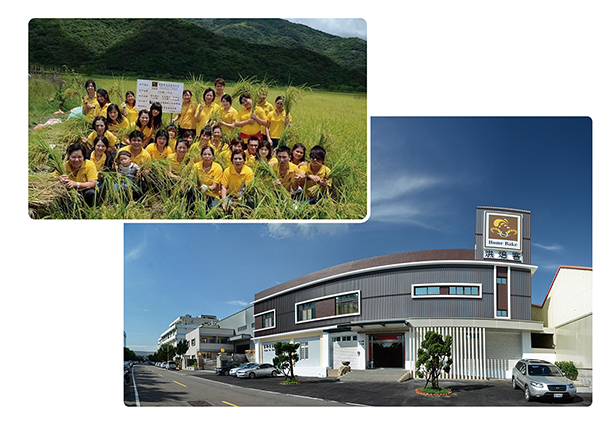 Starting out from contract farming in Hualien, Homebake began cultivating organic rice on a small farmland due to low market demand in the first place. Due to occasional pollinations from other non-contracted farmlands, it was very hard to maintain constant rice quality at the beginning. Despite being rejected by distributors for many times, Mrs. Zhou never gave up. After figuring out the exact causes behind these problems, Mrs. Zhou was determined to resolve these problems by combining all her farm products to develop organic turnip cake for Li-Ren Organic Food. By mixing organic indica rice with organic turnip (without any corn starch further added), Homebake has successfully developed its own organic turnip cake, which is the only one of its kind organically certified in the domestic market. Currently, organic turnip cakes, organic steamed buns and organic steam buns with filling (also organically certified) are sold through Li-Ren Organic Food's channels to provide our consumers with organic products' distinct chewy texture and sweet fragrance. Despite high cost and low profit, Homebake will continue to persist into the future.